Leo Deakin, who has been travelling in South America, wakes up in hospital to find out that his beloved girlfriend, Eleni, died in the same coach crash in which he was injured. Devastated, he arranges for her body to be flown home to her native Greece, but her loss forces him to fall into a deep depression and he pushes his family and friends away. 75 years earlier, Moritz Daniecki is in Siberia, after surviving the Great War, and is desperately trying to make his way to his home in Poland to find the love of his life, Lotte. Yet the conditions suggest that he will never finish his journey. Will Leo eventually get over the grief of Eleni’s death? Will Moritz ever be reunited with his love? And do Leo and Moritz have more in common that being separated from the loves of their life? Romance is not a genre that I enjoy, but in this case, the historical aspect of Moritz’s story appealed to me. 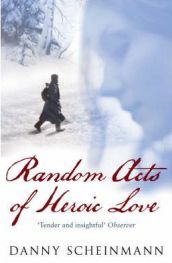 One advantage of ‘Random Acts of Heroic Love’ is that it is two stories in one, told in alternate sections rather than separately, and they work well together in that when one is becoming tedious, the other is just becoming interesting. I found Leo’s story initially very moving and compelling, but then he moves into a period of complete introspection when he becomes obsessed with the idea of Eleni’s spirit still being near him, which became incredibly heavy-going. Moritz’s story, on the other hand, started out very dully, because descriptions of war are never going to be entertaining, but his spirit and determination to make it home are catching and his story becomes more intriguing over the course of hte book. The two stories are told differently, in that Leo’s story is told in the third person, whereas Moritz’s is told in the first. That was initially quite off-putting, because I didn’t understand who Moritz was talking to at first, although it eventually becomes clear it is his son. It is also quite hard to switch between the two stories – there would usually be a couple of chapters of one story before switching to the next, hence stopping the flow. However, it is just a matter of becoming used to the format and after a few chapters, I didn’t have any real problem in following it. Another plus is that the chapters are quite short so that there isn’t too much information to assimilate in one go. The standard of writing is very good, even in the odd slow section, it flows very well. And the author has clearly put a huge amount of effort into research, particularly in Moritz’s story – in an afterward, Danny Scheinmann says that he spent six years researching and writing the book. That does make it stand out from your average romance and is probably why it made it onto Richard and Judy’s 2008 booklist. And apart from the initial changes in tempo between Leo’s story and Moritz’s narrative, I liked the way that the author made an effort to give the stories their own identity. If it had all been Mortiz’s narrative, I think that would have been too much, but interspersed with Leo’s story, it is a lot easier to read. It is hard to say whether I liked or disliked either character, because I didn’t really feel a lot for either of them. Initially, I felt sorry for Leo, but his personality is such that, once his initial grief is over, it is hard to really warm to him. He is obviously going through some sort of breakdown, but I don’t think the author portrayed him quite well enough, otherwise I’m sure I would have had a lot more sympathy. As it is, Leo becomes annoying at times, forever spouting on about physics and animals mating (he’s doing a PhD on ants, the interest in physics is completely random), and I just wanted him to move on. I think everyone has the right to time to grieve and self-introspection is some people’s way of coping (mine, in fact) – it just doesn’t make for very interesting reading. I don’t think we get to know Moritz all that well at all, because although he is telling his own story, he doesn’t give away an awful lot of information about how he is feeling – it is more about his experiences. Some of these experiences are horrific and very interesting to read – I know very little about Eastern Europe’s role in the First World War. The only real insight into his soul is through his love for Lotte, which knows no limits, but I found that a little bit too much at times. He barely knew the girl before leaving to fight, yet after three years is still harbouring the fantasy that he loves her. Some may find this romantic and appealing; I’m way too cynical and think that he was merely in love with the idea of someone he thought he knew. It is clear from the start (and indeed says on the back of the book) that there is somehow a link between Danny’s and Moritz’s story, although it is never made clear exactly what this connection is. I think this was a clever idea, because it really did maintain my interest through the parts of the book that were a bit more hard-going than others. However, towards the end, I do think it was dragged out a little too far and I just wished the author would get on with things. It is partially based on a true story, so I think that the author probably took it very personally and wrote with more care than was perhaps necessary. It may suit some, but I prefer a little more snappiness in my literature. I enjoyed the book overall, but it certainly wasn’t without its flaws and it is not a story I have any inclination to read again. Readers who enjoy well-written romance will probably enjoy it a lot more, especially if they enjoy a historical angle – although bear in mind that the Great War isn’t exactly the cheeriest of situations. I would recommend borrowing it from a library rather than paying full price for it. Three stars out of five. Published by Transworld Publishers, it has 384 pages. One Comment on "Part heroic, part self-absorption"